POOR PERFORMANCE: Is your car feels that it has all the sudden lost power where it feels that your car can’t get out of its own way then your catalytic converter may need replacing. You may also experience the vehicle jerking or the engine stalling due to the sudden increase in back pressure that a failing catalytic converter creates. FUEL CONSUMPTION: A failing catalytic converter will cause a noticeable increase in the amount of fuel your vehicle consumes. ODD ODOR: When catalytic converters start to deteriorate there is often times an odd smell. 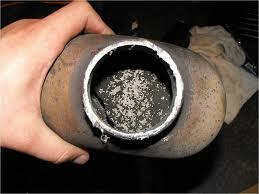 This is generally caused by when the catalytic converter over heats and the components melt. When this starts to happen the catalytic converter no longer functions properly trapping gases. 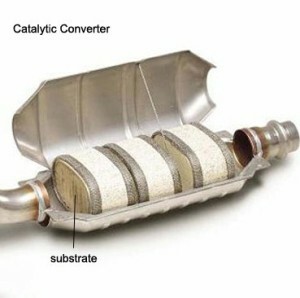 In some cases these trapped gases get so hot that when they ignite they explode tearing the catalytic converter apart. Knowing these symptoms can alert you to a problem before it causes more damage and more money. Catalytic converters should be checked routinely to ensure they are working properly and you can keep more money in your pocket. Problems with vehicles need to be addressed as soon as possible check with your local technician today if you need help troubleshooting issues with your vehicle.